The Mobile Riverine Force (MRF) principally operated with several types of boats. Most, except the ASPB, were converted LCM designs with 1/4 inch armored plating and added re-bar in many areas to blow a rocket before it hit a critical part of the superstructure. The MRF started with three basic boat types: (1) the Armored Troop Carrier (ATC), also known as the Tango boat, served as the real work horse of the MRF and was by far the most prevalent; (2) the Monitor was the floating tank of the MRF with either 40 mm turret or a 105 howitzer mount, 20 mm mounts, a few 50 cals and mortar mounts of various sizes; and, (3) the Command and Communications boat (CCB), or Charlie boat. This boat is where the Officer in Charge was riding and communicating. The CCB was also referred to as the Command and Control Boat. The CCB was a converted Monitor with a command center in lieu of a mortar pit. The boats of the Mobile Riverine Force were commanded by enlisted personnel (usually a Chief, 1st or 2nd class Boatswains Mate, although there were several other rates at boat captain as well). 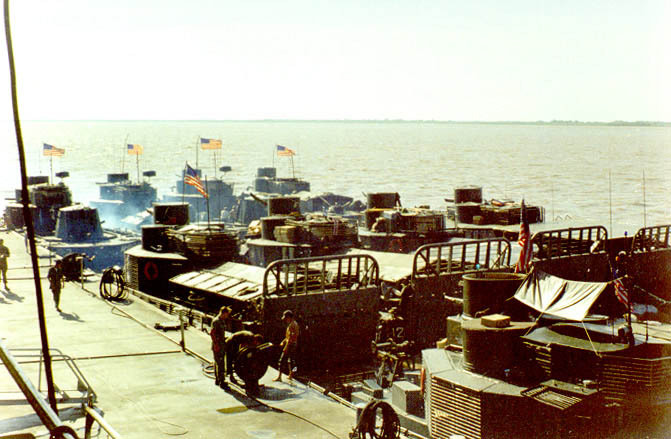 Two additional boat types were added to the force because of special conditions in Vietnam. The Assault Support Patrol Boat (ASPB), or Alpha boat, was made to be faster and more maneuverable. Fast is a relative term, since 13 to 15 knots wasn't fast except when compared to the average 8 knots of the rest of the boats. The Alpha was equipped with mine-sweeping gear to run in close to the bank and clip any command detonated wires. Two Alphas generally headed a column of boats streaming minesweeping gear and another Alpha was usually at the back of the column (for those of you who are duck hunters you'll understand why that was called the "coffin" position). Previous to the Alphas, the Tangos were generally used as the minesweepers. That didn't make sense though since putting an 8-man crew and a platoon of Army troops at risk wasn't a great idea. So along came the Alpha with a 6-man crew to take up the riskier duty assignments. Also, specifically designed to burn foliage along the river bank was the addition of the flamethrower-equipped Monitor, known as the Zippo boat. Each squadron of boats also had a tango boat which had been converted as a Refueler Boat. (Sorry, I don't have any pictures of a Refueler). Also, there was a bunker busting boat converted from and Armored Troop Carrier which was equipped with high pressure water cannon. This boat was nicknamed the "Douche Boat." If you are interested in the design specifications provided in the NavShip Publication 250-452, published in May, 1967, click here. For information about boat specs and radio equipment see this page. In the photo below there are four Tangos in the second row, the outboard of which is equipped with a helicopter deck, which makes it an ATC(H), while the others in the row are ATC's. In the last row, from left to right, a Monitor, a CCB (I think), a Monitor, and a Zippo. No ASPB's appear in this photo. They may have occupied the front row when rafted to this particular MRB pontoon. The MRF was made up of two assault boat squadrons initially (RivRon's 9 and 11) and later expanded to four with the addition of RivRon's 13 and 15. Squadrons were technically called River Assault Squadron and sometimes referred to as RAS 9 or RAS 11, but usually retained the "RivRon" title. Each squadron contained two divisions, RivDiv 91, 92, 111, 112, 131, 132, etc. Within each division there were generally 8 ASPB's, 13 ATC's, 3 Monitors, 1 CCB and perhaps only one Zippo and a Refueler attached to a Squadron.